Translation of Michael Stoibers text in Hannoversche Allgemeine Zeitung, March 15, 2017. There has never been so much emptiness with such a simultaneous abundance of thoughts at Kunstverein Braunschweig. It’s due to the British multi-talent Tim Etchells. The artist, born in 1962, has made a name as playwright, performer, writer, and stage director. He especially became famous for founding and leading the performance group Forced Entertainment, which enriches the contemporary theater for more than 30 years with smart plays, brave improvisations, and touching slapsticks. In the past, they were part of the Theaterformen-Festivals in Braunschweig and Hanover for several times. Etchells appearance is magnificent. He transforms the 15 exhibition rooms of the Villa Salve Hospes in a brilliant manner into a resonance chamber of his improved and spoken audio play. 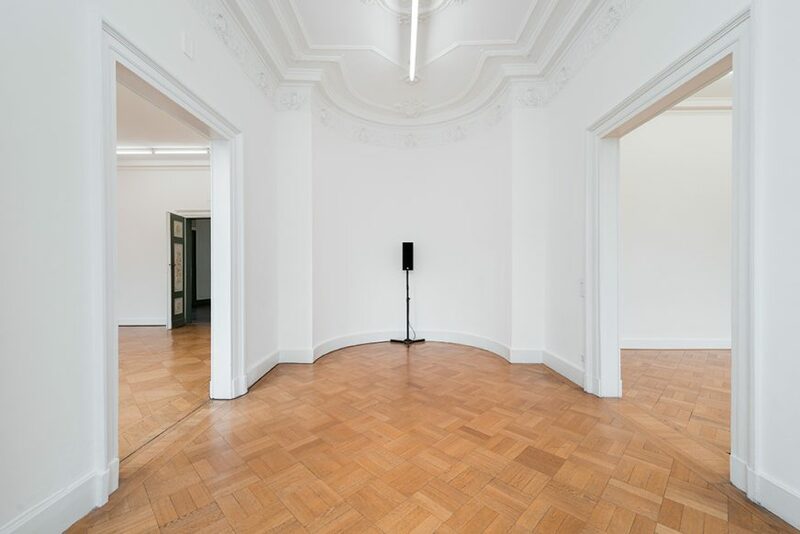 When visitors enter the first room, they become surrounded by the allover distributed, strictly and anthropomorphically acting black loudspeakers with the artist’s voice persuading: “Go with your head”–Do what your mind is telling you. Tim Etchells repeats the order several times, whereby he changes its rhythmic and pronunciation. In an almost musically manner it recharges over and over again with a new feeling and meaning. An adjacent loudspeaker acts out the exact opposite command “Go with your heart”–Follow your heart. These contradictory, acoustically layered imperatives form a conflict, a drama of values. It affects the visitor’s head, where it will be rethought. They evoke that Etchells’ performance will not remain with him, but rather it becomes the matter of its listener in an Aristotelian meaning. Alike the theatrical praxis of Forced Entertainment, it activates the audience similarly intelligent and irresistible. Speaking in Braunschweig means fulfilling actions with words in the sense of the speech act theory. The artist’s opening performance emphasized that as well. Walking up and down like those Greek philosophers, who thought while walking, he finds his improvised sentences. First at a measured step, then in a faster and more ecstatic running. As if he wants to demonstrate how strong moving and thinking, epiphany and action is related to each other. “Moving words”–words moving: Etchells’ first sentence showcases his art strategy and reveals in a second interpretation, how much words are able to move us. He names other paces, which focus on the entirety of our existence; including: “It’s touch and go” or “Dance”. For the aphorisms of his audio play, the artist used English phrases, which work metaphorically with the body. We become linguistically fragmented, and the trick consists of still finding unity. Nothing else means the paradox title “Together Apart”. A linguistic link of “Pull yourself together” and Tim Etchells’ invention “Tear yourself apart”. There is hope in the contradictory alliance. Not only for the fate of individuals, but also maybe for that of whole societies. From June 15-18 my interactive performance Three Tables is at Tate Exchange. It’s running from mid-day onwards and continues until the building closes each day. Do please stop by to Level 5, Blavatnik Building at Tate Modern and join in the work. 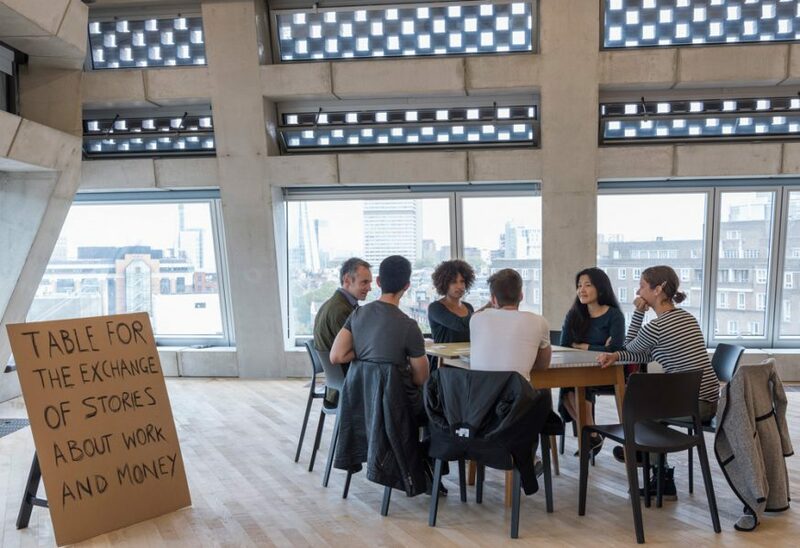 Three Tables is a long interactive work in which three performers seated in the open space of Tate Exchange, draw members of the public into conversations and exchanges on topics that range from work and money to ephemeral things and friendship, family and love. It’s a simple but complicated piece, presented this time by performers Season Butler, Deborah Pearson and Souheil Sleiman (who steps into the shoes of Harun Morrison). I’m really happy that it’s back and that more people will get a chance to take part. We first presented Three Tables last year, as part of the opening of Tate Exchange and it worked really well – a low key format that ebbed and flowed to create some really intense conversations and encounters between strangers. The piece depends on the performers of course, who are really adept and open in their approach, but it’s also very reliant on and open to visitors to the gallery taking up the invitation of the piece to conversation and discussion. In the same time period Tate are also re-presenting my piece Further Provocations, manifested by Andrew Stevenson, in which a series of texts are repeatedly painted, painted out and then repainted on the longest wall in the Exchange space. Hope to see you at Tate over the days.